Learn the hard truth about having the softest flooring in the bathroom. Q: We recently moved into a home with wall-to-wall carpeting in the bathroom. We’d like to replace it, but that really isn’t in our budget now, so we’re wondering how to cope. What should we do? 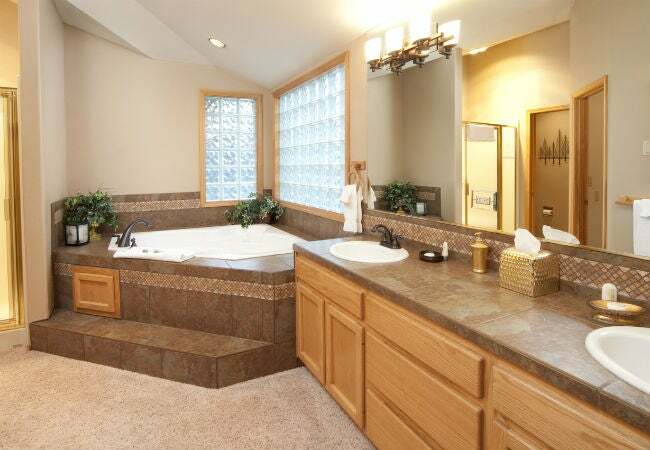 A: Homeowners and building contractors have long debated the pros and cons of carpet in the bath. It’s true that hard flooring such as ceramic or porcelain tile, natural stone, or vinyl is far better suited to humid environments. But fluffy flooring in the bath does have some advantages. Read on for a breakdown of the most common complaints associated with bathroom carpet as well as its benefits to figure out the fate of your floor. Carpet is a magnet for moisture and its by-products. Between steamy vapor from the shower and water dripping off your body, bathroom carpet is bound to get wet—and soak up the moisture like a sponge. This gives mildew and mold an opportunity to grow and spread. Some varieties of mold that commonly grow in carpeting, such as Cladosporium or Trichoderma, can lead to illness or aggravate allergies and/or respiratory conditions such as asthma. That’s why the Centers for Disease Control recommend avoiding carpet in the bathroom. Even if mold doesn’t negatively impact your health, it can eventually rot the subfloor, requiring complete floor replacement. Carpet is a nightmare if you have a leak or flood. 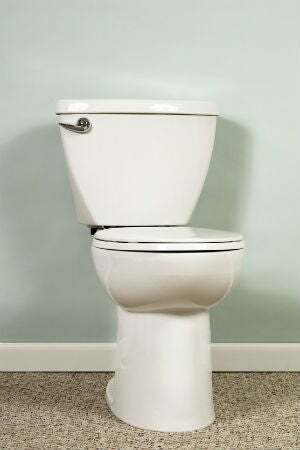 Wet patches on the floor are bad enough in non-carpeted bathrooms, because they may indicate a plumbing leak or a flooded appliance. But with plush flooring, it can be harder to identify and repair the culprit and, if soaked with contaminated water or wet for more than around 48 hours, the entire carpet must be pulled up and discarded. Stains are difficult to eliminate. An errant splash or spill of bleach-based cleaner, liquid makeup, or candle wax can be simply wiped up or mopped off stone, tile, or vinyl. But spills on carpet commonly become set-in stains. In addition, one-size-fits-all solutions rarely work when spot treating carpet. Rather, you’ll need to take a different approach to treating each type of carpet stain—for example, enlisting rubbing alcohol to remove nail polish or a clothes iron to lift candle wax drippings. Note: Synthetic carpet varieties, such as polyester, are more resistant to stains and fading from sun exposure than those made of natural fibers like wool. It feels good underfoot. 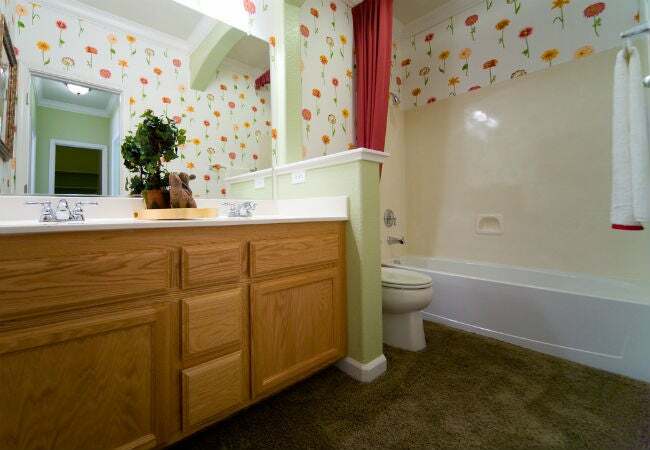 Some folks like their bathroom carpet because it’s soft and warm. Carpet offers a cushion underfoot that makes for comfy walking, especially when barefoot. Also, trapped air between carpet fibers acts as insulation against the cold, which makes coming out of a steamy shower onto the bathroom floor less jarring than stepping onto a cold tile or stone floor. There’s a safety element, too: Even when slightly wet, carpet offers traction underfoot. Wet, slick tile or stone can lead to nasty slip and fall accidents. • Upgrade to the best bathroom fan and run it while showers or tubs are in use to keep water vapor in the air from settling onto the carpet. • Lay mats over carpet by the tub, sink, and toilet to protect it from moisture and prevent mold growth. • Use a sponge or wet vacuum to pick up pools of liquids on tub or sink surfaces that can otherwise spill onto the carpet. • Identify and repair bathroom leaks when you first suspect them. • Dry-vacuum the carpet weekly to eliminate dust and light debris from the fibers. • Blot, don’t rub, carpet spills with a water-dampened paper towel as soon as they occur. If staining occurs, treat according to the specific stain type. • Every year or two, shampoo carpets with a hot water extractor (not a steam cleaner, which can worsen stains and damage carpet fibers) to eliminate stubborn stains and grime. If cleaning a natural-fiber carpet, use cold rather than hot water in the extractor as hot water can shrink and damage the fibers.